To be clear, there won't be any other editions seeing as how I only have a preschooler and kindergartner. Unless you want me to write a sixth grade edition based on my own experience. In that case, let me round up the best trapper keepers, gel pens, and sweater vests, mother huggers. I'm not an expert. I have sent my oldest to preschool for a year and kindergarten for a week. My middle child starts preschool in a month. I'm not entirely sure how many children I need to send to school before I qualify as an expert, but I'm willing to bet that same number would also qualify me as insane. Just as I don't think babies need much at all, I don't think young kids need a lot for school. That is, unless you have a super long classroom supply list to shop for. In that case, my list of basics will be your best friend, so that you can leave room in your cart for boxes of tissue and glue sticks. I believe in quality over quantity. As easy as it would be for me to fill my kids' closets with shoes, the reality is that they pick a few pairs they love and grow out of the others before they wear them. Buying quality ensures that they are supportive of their growing feet, and that they are durable enough to hold up. An added bonus is that if they last through one kid, you can pass them down to the next. A good sneaker is a great staple. You can switch off with sandals when it's warmer (we love Saltwaters) and boots when it's cold. Adidas have never done us wrong; Converse and Zara are also favorites in our house. I was surprised at how much stuff preschoolers bring home. Kindergartners, even more so. A sturdy backpack will last for a couple years, and is great for trips (not to mention, they can wear their own carry-on in the airport). We're big water drinkers, so my kids have always toted around water bottles, but I wouldn't have thought it was a school necessity a year ago. My daughter begged to bring hers because several classmates did, and she has asked to bring one this year, too. I think most schools are accommodating, if not encouraging. I prefer glass or stainless steel. My kids managed to shatter three Life Factory bottles in a week, so we stick to stainless steel now. Contigo has a great option that we grabbed from Costco in a two pack, but my new favorite is this Thermos bottle for kids. It has a button to open the lid, so no leaks, and a straw to drink from. My oldest picked it out to give to my son for his birthday, and now I want to get a few more. What are your back to school necessities? What about lunch boxes? 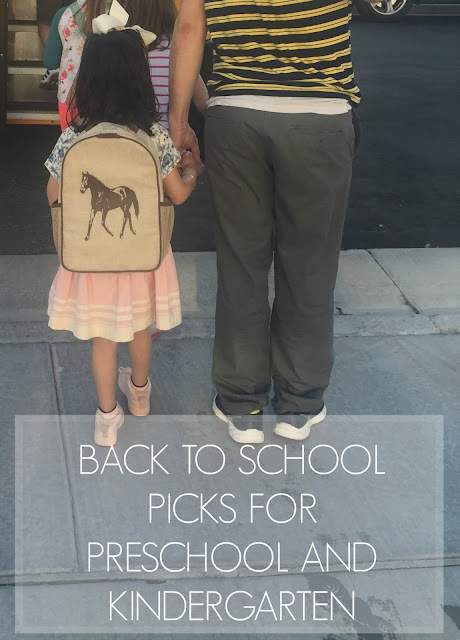 Kindergarten is half day for us, so we haven't ventured into that territory yet, but I'd love any recommendations.